Opera singer American tenor of happy expats in Germany. Jim James Clark the opera singer has been living as one of almost famous and perhaps happiest American expats in Germany since 1991. He composes music, whenever he finds time between teaching friends to sing or when he isn't active in classical symphony concerts. Unfortunately, his time for creating his very own compositions was even more scarce since 2005. J.J.Clark the singer of operas is called James Clark by artist name. 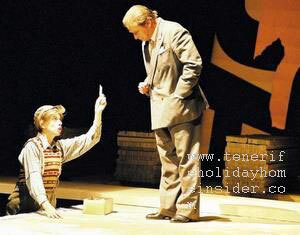 James did well with his leading role as Schwitters or man Dada in 2005 at the Stavovské divadlo Theatre Prague. The music show had been a huge sold out success in London UK where its story takes place. However, the Prague opera called Man and Boy Dada with music by Michael Nyman and acting tenor James Clark also had good critics in the Czech capital. It should be mentioned however that little had been done for proper marketing of the performance. James Clark was also singing at the New York Carnegie Hall when he was younger. After that he occasionally performed at all kinds of European opera houses. During the last years before 2011, he has often taken part in concerts for USA charities. Generalprobe zu GOLEM mit James Clark als Löw. Wir freuen uns auf die Premiere - morgen ist es soweit! Premiere of the Opera Golem was on June 14 with more performances to follow until beginning of July 2015. The topic deals with the conflict of humanity with technology. It is kind of a Frankenstein theme turned into an opera with a dramatic love story. The music is by the Rumanian composer Nicolae Bretan. This interesting article by a German newspaper may be translated by Google Translate. James Clark is often called for 'Einspringen' as an opera singer. Einspringen is a German term in the musical world which means replacing somebody who cannot perform. The reason for it is generally related to colds and flues. However, this American tenor is a very healthy man for his age. He is looking after himself and is practicing regular fitness training and sports. He is also an avid gardener who grows his own organic vegetables. All this as well as constant voice exercise helps him to perform well for singing in operas. It also makes him an ideal tenor to call when replacement is needed by 'Einspringen. From opera singer to classical music online, to find a composition by James Clark which is called Spanish Rapsody and which enhances the video Tenerife Beaches Spain.